I should win because I am always needing a calculator and pencil that works at school! I subscribed to the emails. I would like to win because we don’t have calculators for our classroom. As a math specialist in 2 schools, I am always looking for math materials to use in my small groups and with students who struggle in math. When working on things like data and graphs, calculators are great to have so the students can focus on the concepts that we are talking about and not the calculations of the numbers. And I always have students coming to me with out materials – so having the pencils will be great! I would love new supplies for my classroom. 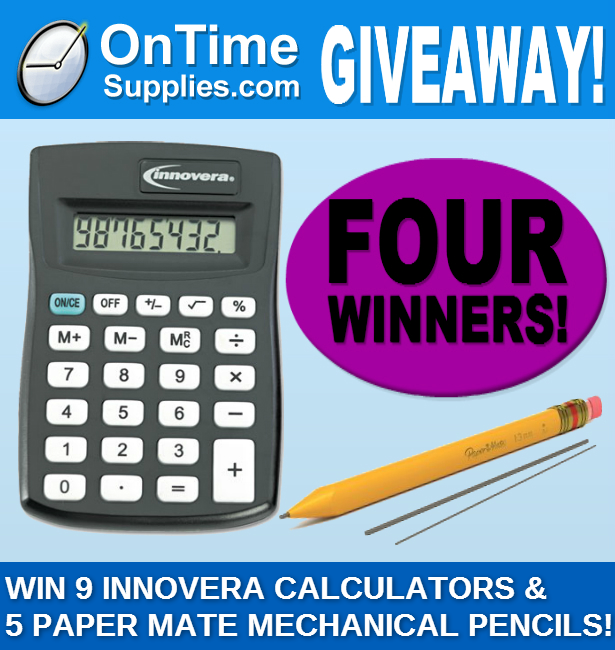 I would like to win the Innovera pocket calculators for my school. We have many students who use calculators on the state STAAR test as an approved modification. I know the administrators, special education, and math teachers would be very grateful. I would also love the Paper Mate Mechanical Pencils as I only allow my students to use pencil in my class. I’m a middle school band director and require every student to have a pencil on their music stand to make markings (no pens allowed). There are often students who do not have pencils. I would mark or decorate these to keep as the “classroom” pencils. I should win because my students who are all diagnosed with Autism would benefit from having their own calculator to use when working on their independent math! Memorizing facts is not always possible for my students – this would allow them to decrease their anxiety knowing they do not have to memorize! I would love to win because the calculators could be used in a math center or with a small group to help them practice basic skills. The pencils could be for those students who always leave theirs at home.